"A pig's got to fly". 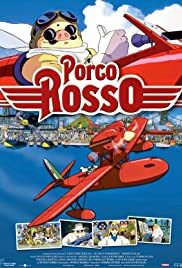 Porco Rosso, known in Japan as Crimson Pig (Kurenai no Buta) is the sixth animated film by Hayao Miyazaki and released in 1992. You're introduced to an Italian World War I fighter ace, now living as a freelance bounty hunter chasing "air pirates" in the Adriatic Sea. He has been given a curse that changed his head to that of a pig. Once called Marco Pagot, he is now known to the world as "Porco Rosso", Italian for "Red Pig."